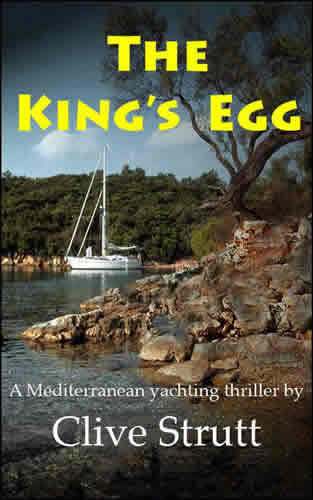 Clive has recently published an ebook adventure thriller "The King's Egg". The sea and sailing had always been Fane’s passion. The former SAS man turned probation officer little realised what was in store for him when he visited a dying prisoner – a former friend and confidant of the late King Farouk of Egypt – a visit that would change his destiny and send him on an action-packed Mediterranean sailing quest to recover priceless treasure once owned by the deposed King. Dogged by political intrigue, the mafia, and conspiratorial allies, this life-changing venture not only had the potential to make him very rich, but also forced him to come to terms with his long-term relationship with the only woman who had ever meant anything to him. The fabulous Fabergé Egg was his quarry, finding it was imperative – but at what cost? "The King's Egg" currently available from Amazon in Kindle format. Click here to Look Inside and / or Purchase on Amazon. "The King's Egg" is also available in all ebook formats from Smashwords. Click here for Smashwords details.